It's been a little while since I posted here... and there are reasons for that. It just came to me that perhaps I'd better share why. Tie Dye Travels is exactly that -- my travels. Unfortunately, life circumstances have kept me off the road for a couple of months. I'm not complaining, though. 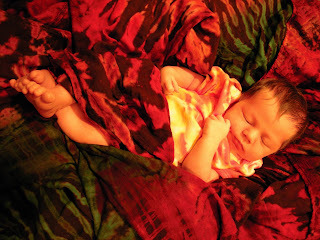 On December 2nd, after several weeks off my feet, my husband and I welcomed our daughter into this world. Hunter Elizabeth was born at 3:51pm on a chilly Tuesday -- nine pounds, three ounces, and 21 inches of perfect, alert, calm child. She's something else. And she's turned our world upside down. What that's left me with, though, is what to do with this blog in the meantime. I have for months collected extra material to utilize here. But there's something about what's happened that's changed my perspective. And I find it more difficult to share my experiences of months past after viewing said memories through these new eyes. So what to do with the blog? That's a good question. 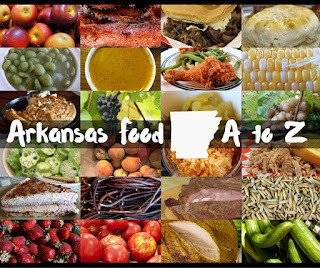 For those who don't know, I am also writing now for Eat Arkansas, the Arkansas Times food blog. 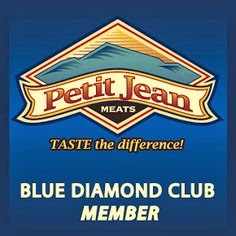 This website has been mentioned on that blog many times, and it seems a great pairing. So many of the restaurant reviews I once aired here first are going there instead. 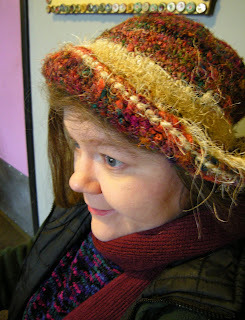 There's also the matter of changes in other venues where Tie Dye Travels is published. 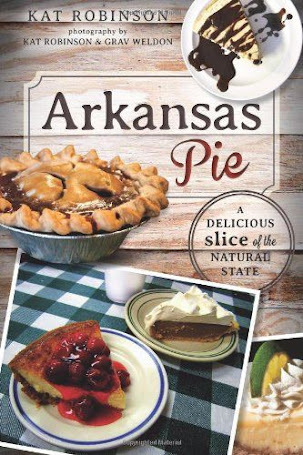 Changes at the Arkansas Free Press have taken it off the newsstands and thrown it in all its glory onto the World Wide Web. Another publication, the brand new Emerald City of the South have stepped in, and I'm proud to say that this column appears there now. Of course, as always this column is available for publication just about anywhere. In all, 2009 looks to begin a lot differently than 2008 did for me. And it's lead me to wonder where Tie Dye Travels should go. Does it remain my own traveler's view of the world? Or shall I also add in other aspects? 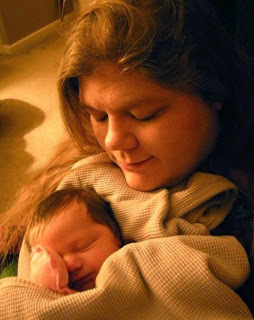 Do I share the adventure of child rearing with you? Comments about the world at large? Opinions? Emotions? Feedback is a lovely thing. Please add yours to this entry's comment section. It's much appreciated. 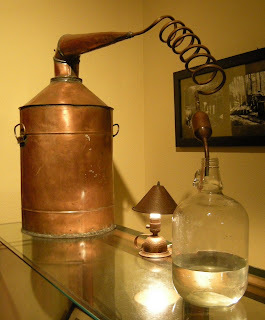 Food for Time Travelers at Vino's Brewpub in Little Rock. The big buzz about the old haunts at 7th and Chester is in recalling the hallowed days of the old DMZ. But for 18 years out of those past two decades since the locale shook with the sounds of punk and early alternative rock, the smell of dough and suds has permeated the music-soaked air. Note: The Gangster Museum of America has moved down the street to 510 Central Avenue, across from Bathhouse Row. Chicago doesn’t like its gangster reputation -- and in the past few years has shed a lot of the museums and shops that might be seen as glorifying organized crime. Las Vegas, home of lots of alleged mob activity, hasn’t opened one yet. 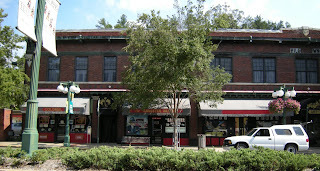 In fact, the only place you’ll find a museum dedicated to gangsters in the United States -- is right in Hot Springs. 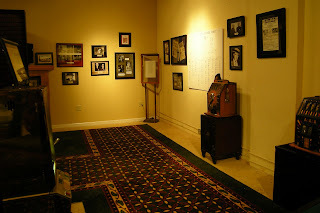 The Gangster Museum of America opened in April of this year… just down from Bathhouse Row and the Arlington Hotel on the town’s Central Avenue. The unassuming façade between a magic show and a pancake restaurant is moderately deceiving… there’s a lot of history here. On a beautiful September day I traveled with several others to visit the unique museum and see what it was all about. I’ve heard lots of people talk about wanting to go, but had yet to actually talk with someone who’d been there. On entry, it’s pretty plain -- it could be anywhere, except for the flapper-era music jamming away on the overhead sound system. You pay your $8 admission (less if you’re a kid, a senior citizen, or with a group), and you go in. Our very knowledgeable tour guide was sure to give a lot of additional information not available on the tabs beside each of the pictures -- great details like who married whom, rumors and innuendo, and places in Hot Springs you can visit to round out your history lesson. 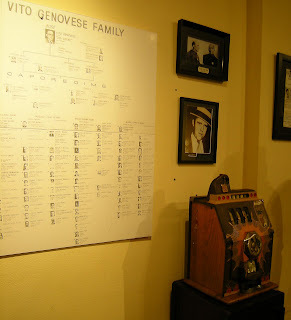 The museum itself consists of four galleries -- the Power Brokers Gallery, which tells the stories of Mayor Leo P. McLaughlin, Judge Vern Ledgerwood, and the rise of gambling in the “open town” -- the Owen Madden Gallery, named after the one gangster who was exiled from New York after a round in Sing Sing and who settled down and married the daughter of the local postmaster in Hot Springs -- the Casino Gallery, which showcases the history of the popular clubs that used to line the other side of Bathhouse Row -- and the Felony Theater, where visitors can watch a specially produced featurette on the museum’s exploration into the rumored catacombs gangsters were supposed to have employed below the city’s surface. Along the way, you learn neat and interesting things about the town that gained two reputations -- one as a place of healing waters, the other as a place of sanctuary for organized crime. You learn about the popularity of moon-shining with the clear and clean waters from the natural hot springs; about two World War II veterans who came back and decided to try and “open up the town” (the veterans being attorney O. Byrum Hurst and Lt. Col. (later governor) Sid McMath. 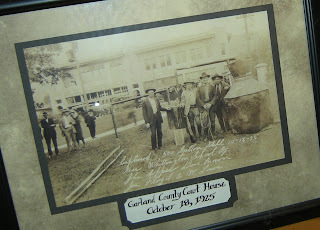 You find out who’s buried in Greenwood Cemetery, and who came to Hot Springs to “go legitimate.” And you learn that Hot Springs was sacred ground -- there were no gang battles here, no arguing over turf. From the beginning, big crime decided this was neutral territory -- and the big dealers from all the syndicates could come here in peace. And there are other great stories, too -- some from people who are still living, like Ed Attwater. The 92 year old credits his long life to drinking nothing but Hot Springs water. He witnessed a lot of the goings-on during those turbulent years -- the twenties, the thirties, the forties. He recalls a lady friend of Lucky Luciano who would stay in town from time to time. He says Luciano would rent out the entire hotel for her, and send flowers every day. It was Luciano’s arrest in 1936 that signaled the beginning of the end for the gangster culture. Our tour guide shared an interesting tidbit -- that when World War II started, Italian dockworkers in New York refused to load ships bound for overseas, until Luciano was released to go talk with them. You learn other things too -- such as the nature of a small vault in one of the galleries. The owner of the Colonial Pancake House next door has the rights to whatever is inside. 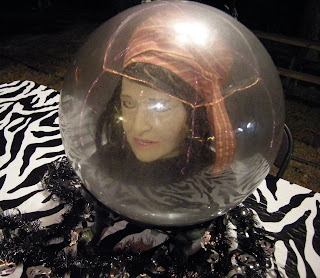 When she passes away, a contest will be held to see who can guess the contents of the vault. 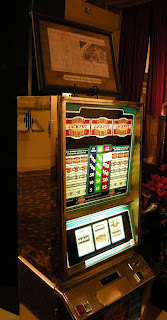 You get a chance to lose a little money yourself in one of the remaining slot machines. This isn’t gambling -- you might come up all cherries or bars, but the machines have been mechanically prevented from giving payouts. And there are plenty of audio-visual displays to sit and listen to and watch to find out more than you’ll get from just the displays. It’s a good balance between interactive media. There’s also the story of Maxine, a lady who looked after call girls and ran a bordello above one of the local clubs. Maxine was something -- she had a convertible, and she’d let her girls ride on the back of it up and down Central Avenue. There’s a unique remaining interview with Maxine Harris Jones on video to watch, and one of the few remaining copies of her unabridged autobiography (few of these exist -- what you’ll find most places is the heavily edited, “names changed to protect the innocent” version). You discover more interesting facts about mob times in town, too -- for instance, that Tony Bennett first performed “I Left My Heart In San Francisco” at the Vapors Lounge… to a crowd of one. You learn the names of other performers and celebrities who came through town -- Frank Sinatra, Sam Giancomo, Hank Williams Jr., Eddie Fisher, Ray Anthony, Phyllis Diller. 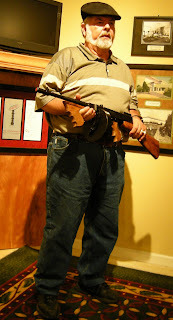 You can even touch and hold a real Tommy Gun… no, it’s not going to fire, but it is amazing to see how heavy one of the big guns are… and it’ll make you wonder at the movies that show “gangsters” waving them out of windows. They’re far too heavy for that, in my opinion. There are a lot of other things you’ll discover there… but if I mentioned it all, what reason would you have to go? It’s an interesting place to see, and something entirely new amidst all the historic museums and attractions along the Bathhouse strip. 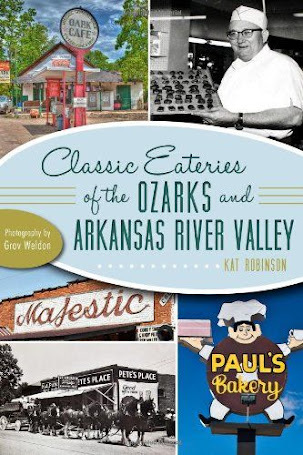 Pair up a visit with a jaunt over to the Fordyce for the history of the National Park, and grab a bite to eat over at the Pancake Shop across the street while you’re at it. You’ll find the Gangster Museum of America at 113 Central Avenue… for more information, call (501) 318-1717 or check out the ever-developing website at TGMOA.com. And be sure to check back -- there’s a lot of space in the building for the museum to expand, and a lot of material to use for such an expansion -- so there should be something worth coming back for in the future. 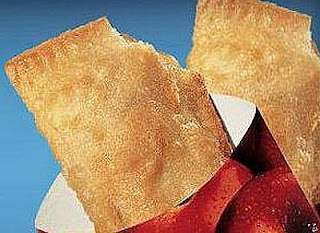 Remember the fried pies McDonald's used to serve back in the '70s? 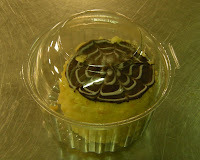 The tasty treats were a personal favorite of mine, even more tantalizing than Happy Meals. I always tried to talk the adults I was with into purchasing one for me. 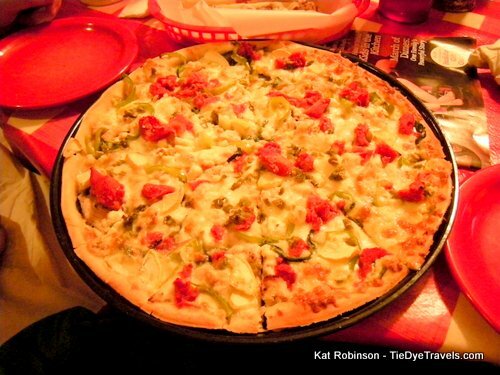 There was something about the texture, the flavor, the sheer warmth and scent of a hot pie that made me happy. Of course, times changed. Restaurants started going healthy. "Fried" became a dirty word. The delectable temptation under the Golden Arches disappeared and I stopped frequenting the franchise. 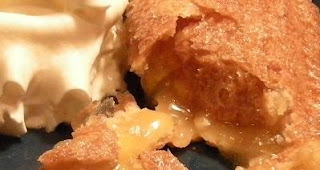 Over the years, I've tried all sorts of pies -- meringue, cream, nut, fried, baked. I've had all sorts of pie configurations -- round, square, wedges, some served cold and some served hot. I've had Mile High Pie from Ed & Kay's, Ms. Lena's Fried Pies, the momentous Strawberry Pie from Strawn's in Shreveport and Boston Cream Pie at the Omni Parker House in Boston. But I never found that first love of pie again. That is, until earlier this month, when on a Saturday evening I happened to find an old friend in an unexpected place, a barbeque joint here in Little Rock. My joy in finding this blessing on a plate was only equalled by the more than reasonable price for the bubbling hot wonder. 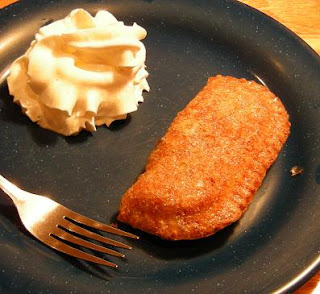 I am a sucker for pies in any shape or form, and after dining on brisket and twice-baked stuffed potato I craved another sweet offering from the dessert menu. And for $1.25, how could I go wrong with a hot peach pie? The place -- Cross Eyed Pig BBQ off Highway 10 in West Little Rock, behind NYPD Pizza. I was told it would take a few minutes to prepare the pie, so I sat down and joined in conversation with my traveling companion. Within minutes, the pie had arrived -- a crispy, golden pocket of goodness served up with a pile of whipped cream on the side. It was very hot and the aroma drew memories out of hiding in my mind. Somehow or another, Cross Eyed Pig has managed to recreate a childhood favorite right down to the crispy bubbles on the surface. The hot pies are perfectly augmented with the cool cream and a real bargain for someone who wants to make a trip down memory lane. Of course, that's not all the Cross Eyed Pig has to offer. Unlike a lot of other restaurants out there, Cee-Pig prides itself on its meat, good and hearty portions that bear witness to great smoke. In fact, I can't brag enough about that smoke ring -- the hallmark of a great piece of meat. Brisket at Cross Eyed Pig is served up in chunky slabs that show off the meat's grain. A good dinner ($7.95) comes with a couple of sides -- and if you miss out on the potato salad with its heavy dose of sour cream, you're making a huge mistake. One very welcome addition to the menu is the Twice Baked Potato ($5.75 with choice of meat). While I've encountered barbeque stuffed potatoes elsewhere, finding them in Little Rock has been more than challenging. Not only does the Cross Eyed Pig carry the specialty, it does it better than I've had elsewhere. By cooking the potatoes, scooping them out, refilling them and baking them again, they're rendered into soft and savory comfort food. Don't want meat in your potato? You can also have the potato as a side item ($3.50). You'll find the West Little Rock Cross Eyed Pig at 6015 Chenonceau Boulevard -- out behind NYPD Pizza, or call (501) 227-RIBS. Or catch the original location at 1701 Rebsamen Park Road for lunch Monday-Friday (you can call (501) 265-0000 to order there). If you do stop in at that location, be sure to say hello to Anthony. One way or another, you'll find menus at CrossEyedPig.com. Remember the first time you got your nerve up to try sushi? 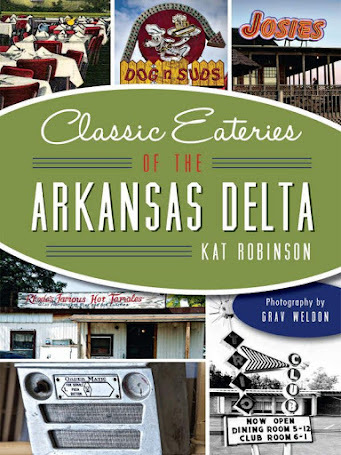 If you live in or around Little Rock and it's been a while since that first experience, chances are you had that first little bite at Mt. Fuji. The venerable Little Rock Japanese establishment has been serving up sushi, tempura, and sukiyaki since the mid-80s. It may not have the dazzling chefs with their flying spatulas and egg tricks at a superheated grill, but it does have one of the best (and most discreet) sushi bars in town -- and a conscientious wait staff to boot. In the past decade, competition has moved in with the major chains and a few minor local operations vying for attention. Even the grocery stores have their own take-home sushi rice creations. That hasn't brought down the quality you'll find at Mt. Fuji. In fact, it seems to have sparked a stronger push towards excellence. Fuji's sushi is predictable only to the point of you know what you'll get when you order a Spider roll, a Razorback roll, or any of the many specialties on the menu. The fish is fresh, the rice is sticky, and the dishes are clean. On a recent visit, we dropped by for lunch. 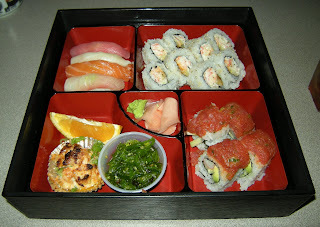 My traveling companion went for the Sushi Special ($9.95), a real lunch in a box, a pretty box at that. The special changes every day in its specifics -- but it always includes four pieces of fresh sushi, a special roll, your choice of another roll (California, Spicy Tuna, Spicy Crab, Grilled Salmon/Cream Cheese, Crunchy Shrimp, or Asparagus) and accoutrements. 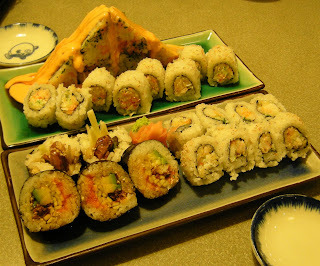 This time around, it came with seaweed, a fish puff, a nice selection of sushi (tuna, conger eel, salmon, whitefish), four big pieces of a special roll that was similar to a California roll but with a mince of tuna and spice on top, and the ordered Spicy Crab roll. I went for the Shrimp Tempura lunch box ($7.95) -- and was surprised at all that came with it. 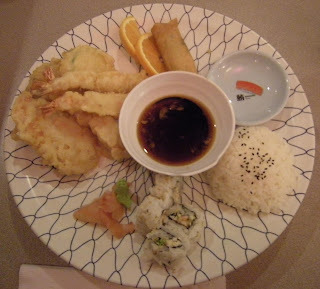 In addition to the three perfectly battered and fried shrimp, the tempura-clad veggies (sweet potato, potato, zucchini), the delicious and salty tempura dip and rice, it also came with four pieces of Crab roll and a spring roll. Both meals were accompanied by a really good miso soup with lots of tofu and a house salad with a housemade peanut-ginger sauce for dressing. I didn't care much for the sauce, but my traveling companion adores it. order. This can be dangerous, if you really like appetizers and sushi like we do -- but it's a bargain, too. We shared four rolls between us -- a New Orleans roll, a King Crab roll, a Crunchy Shrimp roll, and a Volcano roll. While all four were tasty, the Volcano roll without a doubt is our favorite. The spicy shrimp, crab stick, avocado, rice, and seaweed are deftly formed, sliced, constructed into a pyramid and coated with a very spicy and robust Japanese mayo (which, if you don't care for that much, you can have on the side). 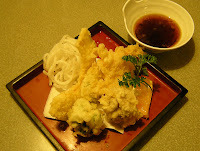 We also went for the Shrimp Tempura ($6) and Vegetable Tempura ($5)(yes, I am a tempura fan!) to go along with our sushi. Our ample portions came with that strange puffy rice styrofoam-like creation that melts in your mouth or in your tempura sauce. We also tried some dessert -- delicious and refreshing green tea ice cream. One thing that does stand out about Mt. Fuji, in addition to the comfortable and cozy surroundings, is the remarkably green green tea. It's a tea of deep viridity that's absolutely perfect on a cold day for rolling up the world's trouble and throwing them against a distant wall. It's well balanced -- not bitter, not overpowering, just what you expect when you think of green tea flavor. While these cold winds blow this time of year, treat yourself to a cuppa. Oh, and the refills are free and ever forthcoming. You'll find Mt. Fuji in the Breckenridge Shopping Center off Rodney Parham at I-430. Do be aware that there is a lift for wheelchairs out front -- so don't let the stairs fool you. There's also a delightful little shop downstairs that almost everything you'd ever need to make and enjoy sushi in your own home -- along with gifts and staple items. And if you really like sushi, Mt. Fuji offers plenty of sushi-making classes with patient instructors. For more information, call Mt. Fuji at (501) 227-6498 or check out the restaurant's website. I like going to Mt. Fuji on Monday nights, with the $1 sushi specials, the $10.95 for two maki rolls, and the buy one appetizer, get one half price deal. We can really do some damage. One interesting thing we tried on our last visit -- Agedofu, which is fried tofu topped with bonito flakes. We did expect it to be tasty. We didn't expect it to move. Splendid. have changed. Today we're more concerned about danger and are more discouraging of childhood pranks. And fewer families are participating in the door-to-door tradition of Trick-Or-Treating. But there's no reason to completely ditch the tradition. 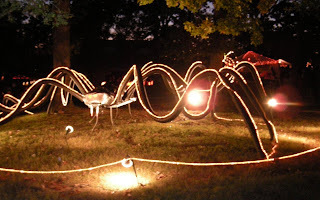 Instead, it's been adapted into a great, fun event everyone can enjoy at the Little Rock Zoo. 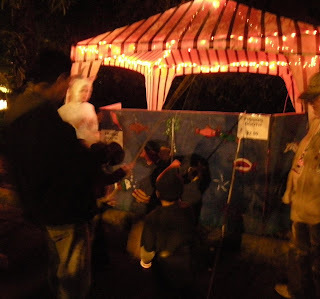 Boo at the Zoo is the annual Halloween event the Zoo puts on each year. 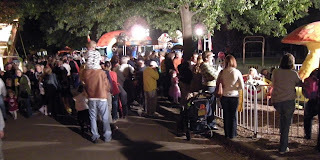 For a whole week or more each year, the Zoo opens up at night to entertain young folks with rides, games, and stands where kids can trade tickets for candy. wear that great Halloween costume -- without having the worry of dodging cars and walking through the neighbor's yard. ($4 for members) each person gets a goodie bag and a strip of candy tickets. Candy here is well monitored -- different companies and groups run each of the candy stations, offering all sorts of goodies. 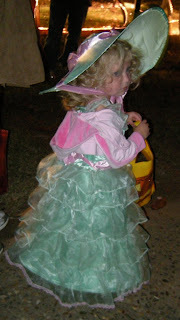 everyone receives a similar amount of candy -- and helps parents keep track of how much candy their child has brought in. 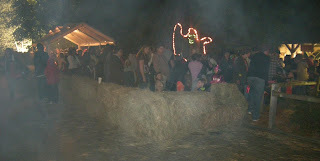 There's a Haunted House, and the Haunted Train Ride, and more. 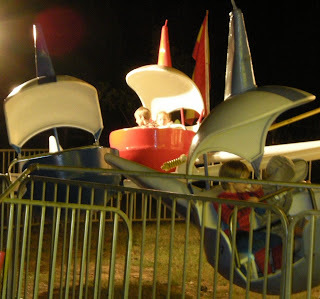 There are also carnival rides -- these are an additional charge, but there are booths where you can purchase tickets to ride the Ferris Wheel, enjoy the Fun House, and get Scrambled. 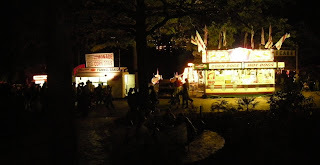 There are also concessions with autumn favorites like funnel cakes, corn dogs, and popcorn -- especially popular for folks who missed out on the State Fair. And then there's Cafe Africa, the renovated old Cat House that's now a spectacular function space with a concessionary. You can grab dinner and get off your feet for a bit before heading out for more fun. Of course, there's a place to have your picture taken. 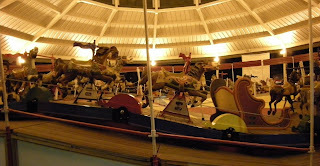 And this year, you can ride Over the Jumps, the fabulously restored carousel that's recently reopened on Zoo grounds. For those of us who rode as a kid, it's a real treat. If that wasn't enough, kids have a chance to meet a real zoo celebrity this year. On Halloween night, October 31st, Jack Hanna will be on-hand to sign copies of his new book at 8 p.m. -- and then will tape a TV show at the Civitan Amphitheater on the Zoo grounds. 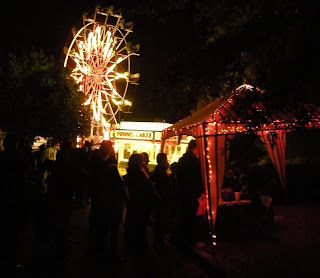 The Zoo's staying open late that night -- until 10 p.m. 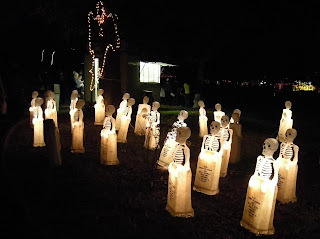 It's a lot of fun, it's safe, and you don't have to worry about what might come home in your kid's candy sack. 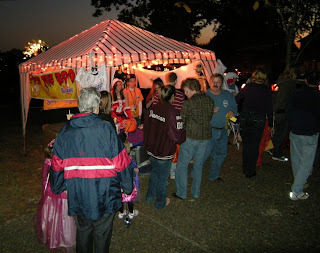 For more information on Boo at the Zoo, call (501) 661-7208 or check out the Little Rock Zoo website.